Have you heard about the Freschetta Rally for Real Pizza? Freschetta believes that frozen pizza shouldn't only taste better, it should be better! With fresh ingredients. "Freschetta®frozen pizzas are made with top-quality ingredients and taste-tested recipes, just to make sure your pizza will always deliver Fresch® flavor." With a large family we are always having a game night or family night at least once a week and of course that means snacks! My family loves to have pizza, and what mother doesn't want the freshest possible ingredients for her family? I do! Sometimes there just isn't enough time to make pizza from scratch so knowing I have a pizza like Freschetta on hand makes my choice alot easier. It is comforting to know that Freschetta cares about what I serve my family. Be sure to "like" Freschetta on Facebook, and join their Rally by adding your photo to the Rally Mosaic on Facebook. Each week they will choose 100 winners to each receive 5 Freschetta pizzas. Then on March 30th, they will choose 10 winners to each receive Freschetta Pizza for a year! Hurry over there and enter. We love pizza for a snack, but free Freschetta pizza is even better! I was asked to do a post for Borowitz and Clark attorneys specializing in bankruptcy Los Angeles area. It is sort of funny that this post came up, because as a family we have discussed how much people rely on credit and loans. We are personally teaching our children that if you don't have the cash on hand, you don't buy it. Unfortunately we have become a society that thinks they need everything and they need it now. So instead of waiting and saving to make a purchase, we buy it on time, or with a credit card, and end up paying more than we would if we just waited and paid cash. This would not be so bad, if it was only one item, but it never stops. There is always something new, bigger, better, that "needs" purchased. I have personally seen people buy an item with credit, and end up paying far more than they would if they had just taken a few months to save and pay cash. Wouldn't it be great to just stay out of debt to avoid bankruptcy? Another habit we are trying to teach our children is to always put a little into savings. Everyone thinks if they can't put away $50, $100, $200 a week or month that it just is not worth it. Is that true? NO! Every little amount you put away adds up. $10 a month doesn't sound like much, but at the end of the year an extra $120 dollars comes in handy. What about $20 a month? I can think of many advantages of having $240 at the end of the year. And yes, as adults we would like to save more, but it still works. Don't get disappointed and stop just because you can only save $10 or $20 a month. And occasionally, you may be able to do more. Then of course there is budgeting. If you don't have an outline of where your cash is going, it is too easy to spend money that should go towards a bill or debt. Then you end up in more trouble because you start out the next time already behind. You have to play catch up. We really suggest a written budget. Even divide the payments up into separate envelopes so you don't use funds that are reserved for something else, like a bill. Each one of my children is being taught how to write and maintain a realistic budget. Another thing that helps our family stay out of debt is we have taught them to shop wisely. Look for items on sale. You don't always need the name brand. Also consider a used item over brand new. And of course they all use coupons. I hope some of these ideas help someone. If you have any great tips or lessons you are teaching your children on finances or how to avoid bankruptcy, leave a comment and share with your neighbors here At the Fence. As you know we are still in Florida! Panama City area now! I still can not believe how warm it has been. Anyway, I received a book, The Complete Idiots Guide to The Best Family Destinations. Since I was born in Florida, and have lived here off and on my entire life, I can actually say that they cover alot of the neat family destinations. Yes, of course they cover the big things like Disney, EPCOT, but I was surprised how many of the smaller places they cover. Like they actually mention Green Meadows Petting Farm in Kissimee. We had a great time there a few years ago. And of course there is Homosassa Springs Wildlife Park in Homosassa. They do mention the Arabian Nights, but not Medieval Times, which we were able to visit this trip while in the Orlando area. Also missing was MOSI and the Tampa Lowry Park Zoo both in Tampa and both well worth visiting. Then when you mention the beaches, we have been to may of them. From Panama City Beach all the way to Clearwater Beach. Then of course there is the other side of the state. We love to camp on the east coast and go looking for shells in the morning. We have found sand dollars, a seahorse of two and a sharks tooth, along with many beautiful shells. Overall they do a great job. Yes there are some places missing, but they can't cover everything in every state. This gives you a great overall resource for information. The book covers all over the US, so if you are planning a trip anywhere in the states this would be a great source of information on family locations to visit. We used this book in Texas a year ago, and found some unique places to visit then also. I have a tendency to prefer the quieter less sought after choices, rather than the well-known crowded sites. This book includes a sampling of both! Be sure to get this book and keep it on your shelf, you never know when you might need it. One neighbor will receive a copy of The Complete Idiots Guide to The Best Family Destinations. Disclosure:I received no monetary compensation for this post. 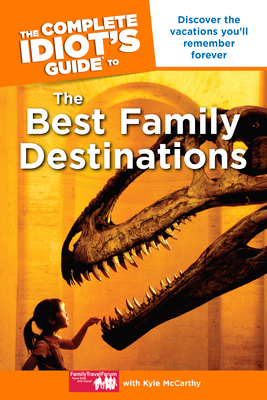 I did receive one copy of The Complete Idiots Guide to The Best Family Destinations. All thoughts and opinions are mine. Are any of you or your family members lactose intolerant? I have 2 that react, but not all the time. And one of them loves yogurt, so I was excited to hear about Yoplait Lactose Free yogurt. Now I don't have to guess if she can have it this time, because Yoplait now has the Lactose Free yogurt. And it comes in four delicious flavors; Strawberry, Peach, French Vanilla, and Cherry. I have to say that Cherry is my favorite, while some of my children like the French Vanilla. Just think what a benefit this is! You can use this in recipes, just for a snack, in smoothies, etc. and not have to worry about Lactose Intolerance. My children love fruit smoothies made with yogurt, and now I have a yogurt I can use and know that my daughter won't react to it! Wonderful! We usually use yogurt, orange juice and their favorite fruit. Freezing the yogurt ahead of time makes it even better. I haven't tried it yet with the Yoplait Lactose Free Yogurt, but I am sure we will. The Lactose Free Yogurt from Yoplait contains 50% of the recommended Daily Value of Calcium, with Vitamins A and D in every cup. And no artificial sweeteners. 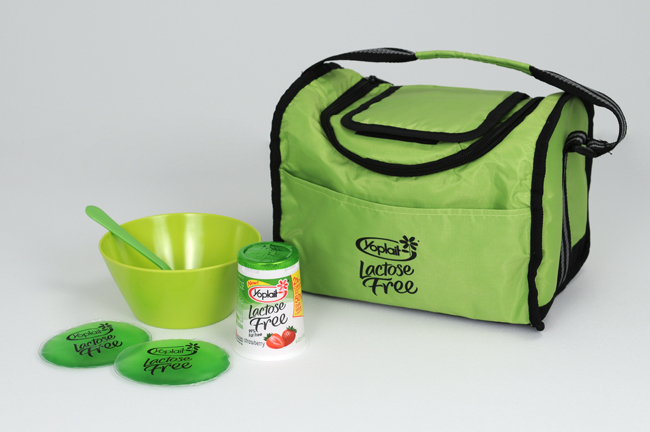 With my pack I received a VIP coupon to purchase Yoplait Lactose Free yogurt*, a Lunch Tote, 2 Gel Packs, an individual bowl, and a spoon. A really neat green color! And...one of my neighbors will be receiving a Yoplait Lactose Free Yogurt Prize Pack just like mine! Be sure to find them on Facebook and Twitter. Our trip to Florida is going great! We have had a wonderful time. While here we have visited several tourist attractions. Now, I don't know about you, but I am always concerned about getting separated, or losing someone. Not hard to do in a large crowd. Or if you are sitting waiting for them to get off a ride. Well, Striped Shirts has come up with a perfect solution! Matching striped shirts. Now this is not why they were designed, but it sure worked for me. Perhaps they have another selling point now! They were originally designed so that women and little girls could wear their team colors in a stylish manner and not have to wear "guy" shirts. I believe they have achieved their goal. We chose red and navy blue. Before I go any further though I need to tell you that this is one of the most comfortable shirts I have worn. I LOVE mine! And yes, it did help me keep track of my youngest daughter. I just had to look for the matching shirt. And it made it easier for her too! Just check out the pictures we took and see how easy it is to find us. Getting on a ride with dad. Can you find both of us in this picture? The shirts are 95% cotton and 5% Spandex. Extremely comfortable. Now if we can just get them for the rest of the family! It definitely helped me to keep track of her throughout the day. It was very easy to spot the matching shirt even in a large crowd. Have any travel plans where you will be around crowds? You might want to check out Striped Shirts. The shirts are $19.99 each, and you can purchase them right on their website. I personally think they are great. Yes, you may find matching shirts elsewhere, but these are definitely well-made, and as I stated before very comfortable. Be sure to enter this giveaway as Striped Shirt will be giving away to one neighbor 1 adult shirt with 2 children's shirts. Disclosure:I received no monetary compensation for this post. I did receive 2 Striped Shirts for review purposes. All direct quotes are taken from the Striped Shirt website. All thoughts and opinions are entirely my own. Since moving into our neighborhood, we have gotten to know all of our neighbors on our street. It is so nice to know all of them. We have been blessed with such nice people to live by. We all look out for each others' kids and help each other out when we need to. I needed to run to the store yesterday and instead of having to take all the kids with me, I just asked my neighbor if they could come play in her backyard while I went. Then I am able to have a little alone time while I grocery shop and the kids can have fun with their friends. I don't feel bad because I will do something to pay her back soon. A few weeks ago I watch their dogs while they were away on vacation. It turned out to be quite interesting because she had given me her key and written down the instructions, but the dog had eaten the instructions so I had no clue what to do when I came in and the home secrity Laurel started going off! I had to call her while the alarm was going off and ask her for the password. I don't know how your husband is, but mine likes the car to stay clean. With 8 of us riding in the vehicle though, it is not quite that easy. I mean on any trip almost everyone brings a drink and a snack. That means 8 empty water bottles and several empty packages (form crackers or treats). Sometimes the snacks have been crushed into the car floor mats. Then of course there is dirt or gravel from shoes, tissues, receipts, and who knows what else. We have to clean the vehicle thoroughly at least once a week. That means, emptying all the pockets, drink holders, console, etc. It includes cleaning under the seats. Which is scary sometimes, because you never know what you will pull out! Then of course there is the favorite catchall, the dashboard. Up there you will find sunglasses, an atlas, books, business cards and an occasional charger for a phone or iPod. The last hiding place is the glove box. That is where everyone sticks important papers, coupons and letters and then leaves them. Do we stop there? No, next is wiping down the entire inside of the vehicle. The dash, the console, seats, mirrors, and windows. And don't forget the floor. This must be vacuumed and the mats cleaned. Yes, cleaned! He means the car floor mats too! So after a trip my husband will check the vehicle over and then assign someone to clean the vehicle. He also tells them that he will be inspecting it afterwards and that he wants it done right. Everything must be cleaned including the car floor mats! The outside of course gets cleaned on a regular basis too. Especially after a long trip or after they have salted the roads. He is not a fanatic over keeping it clean, but he wants to take care of what we have. So, when it is time to wash the outside we remove all our magnets (we have Bible verse magnets on our vehicle) and then scrub it all down. In the winter we use a drive thru car wash, but we still try to remember to take the magnets off. Occasionally we have lost a couple that way by forgetting to take them off, and then driving off. How often do you have to clean your vehicle? Are you a neat freak? Or are you like some of our friends who have to race out to "neaten" their vehicle if someone needs a ride? Any hints on helping keep it neat? We just had a great time camping at Wekiwa Springs State Park in Florida. We had 2 tents. A girl's tent (including Zylie) and a tent for mom, dad and the two boys. The first night was extremely warm. Yes, I know it is supposed to be winter down here, but I had a hard time sleeping it was so warm. The second night it cooled off quite a bit. All of us, including Zylie had a good night's sleep. We stayed the next 3 nights in a hotel near a church where my husband was preaching, but then we returned to Wekiwa. This is one of our favorite Florida parks to camp in. A few years ago, we had a night time visitor, possibly one of Zylie's relatives. He stole our entire container of dog food. I mean container and all. The next night he climbed into the back of a neighboring camper's pickup and tried to drag their cooler out. The next morning they showed us the claw and teeth marks in the cooler. So, he probably wasn't one of Zylie's relatives, because her relatives would not have been so impolite as to try to take food without permission. Wekiwa Springs has several trails to hike and then you can visit the springs. They are gorgeous! The girls all hiked to the springs one day, and then they hiked another day and had lunch by the springs. The boys hiked up by themselves another day, and the ranger allowed them to hold a baby gator. See the pictures. We saw several squirrels, birds, a couple of deer and several wild turkeys. While taking trash to the dumpster they also ran into a snake. Nothing harmless, but interesting nonetheless. There is a squirrel in there! Finally on Wednesday evening we went out for several hours and it poured. Thunder and lightning was included. We returned to find one tent had leaked. Not bad, but several things were damp. We managed to arrange things and get some sleep. I have to admit, other than the first night we had excellent sleeping temperatures. Zylie agrees! The park ranger was watching this one. This is the baby gator. This bee wanted their Sunkist. Zylie assured us it is not a honey bee! On a personal note, I was eaten by mosquitoes. I mean bad. Zylie? None at all! I think it is all the fur! My family could not believe how many bites I had on my arms. And on top of that I received a sunburn at Legoland. Yes, I know that being a native born Floridian I should have been more careful, but I wasn't. So now I am paying the price. Here is the very last extra entry for Zylie. Tweet, post on Facebook, do a post of your own directing people to the Zylie giveaway. For each one you do, you will receive and extra entry. Make sure you enter through Rafflecopter on the original post. Have another way to share the news, let me know and I will add it to Rafflecopter on the original post. How is everyone today? It has been really hot here in Florida lately. On one of the cooler days we had, we visited the Museum Of Science and Industry (we will call it MOSI here At the Fence) in Tampa, Florida. The whole theme of MOSI is to learn by doing/playing. A very neat hands-on experience! I wish some of you could have gone with us! It is so much fun to have friends along! It "is the largest science center in the southeastern United States and home of the only IMAX® Dome Theatre in the state of Florida. Guests are encouraged to "learn by doing" in this scientific playground of special exhibitions and more than 450 hands-on activities." MOSI is a not-for-profit, community-based institution and educational resource dedicated to advancing public interest, knowledge, and understanding of science, industry, and technology. With a total size of over 400,000 square feet, MOSI is the largest science center in the southeastern United States, and home to the only IMAX® Dome Theatre in the state of Florida. Kids In Charge! The Children’s Science Center at MOSI is the largest children’s science center in the nation. Disasterville, featuring WeatherQuest, combines education and 10,000 square feet of interactive exhibits on the science behind natural disasters. MOSI’s newest permanent exhibition, The Amazing You, explores the fascinating world of birth through end of life. Conquer your fears and experience an adrenaline rush like no other on MOSI’s newest permanent attraction, the Sky Trail® Ropes Course, featuring 36 elements on a 12 – 36 foot high, multilevel structure. MOSI is the proud winner of the 2009 National Medal for Museums by the Institute of Museum and Library Services, the nation’s highest honor for museums. For more information on MOSI, visit www.mosi.org." When you first walk in the door there is the ticket office where you buy tickets, and you are met by two HUGE diplodocus dinosaur skeletons. MOSI is one of the few museums in the world to "display the largest articulated dinosaurs ever discovered." On the second floor you enter... DISASTERVILLE!! Disasterville covers nine types of disasters in a fun way! These disasters include : floods, hail storms, hurricanes, tsunamis, lightning, tornadoes, wildfires, earthquakes and volcanoes. They also tell you how to be prepared should you ever experience one of these disasters. After that you head into the Bay News 9 WeatherQuest room. In here it shows you how much work is put into reporting, forecasting, and more. You can step into the roles of reporter, anchor, emergency manager, producer, or a scientist all inside a newsroom designed as Bay 9 News Studio.Below you can see my dad and sister as news reporters! Once you hit the third floor you go through The Amazing You! section. Guests can explore whats amazing about each stage of life, teaches you how to stay healthy, and more! M's favorite spot in this area was the Your Face...Aged! You sit down in front of the camera and push the button to take a picture. Then you wait for it to load and then you can slowly click through what your face would look like at different ages. So keen! They also had one area that had jokes, funny pictures, and more! Everyone enjoyed the section that had jokes and funny pictures. They state that laughter is good for your health! Imagine that. Mom had to listen to all the jokes afterwards! Next up is the High-Wire Bicycle! You are harnessed unto the Bicycle and then you ride out across a 98-foot-long cable suspended 30 feet above the ground! Can you believe it? My little sister M. finally (after being assured she could not fall) decided she wanted to try it. I have included a short video of her doing it. After she got off she kept talking about how fun it was! After the High-Wire Bicycle you can go to the Sky Trail Ropes Course. Let me tell you - This is AMAZING! I have included a short video of my two brothers and my little sister doing this. They really enjoyed it! This is a huge area where you are attached by a safety belt and can climb and explore all over! Can you tell she liked it!?! Another thing you don't want to miss (especially my little sister!) is the Kids In Charge! area. Kids In Charge! is The Children's Science Center at MOSI that is designed for children ages 12 and under. I think you do need to be told that everybody in my family enjoyed this area. Not just my little sister! There are several different areas in here. The first thing we did was the Magnetic Pendulum. You take these little magnets and slowly pull them your way (after they are attached) but be careful! If you pull to hard they will come off! After doing it for just a couple of minutes we got it going really good. M. was amazed! Next was the Wheelchair Racing. There is a section where there is a wheelchair and a timer and you have to time how long it takes you to go to the end, turn around, and come back. Then we headed to the Tug Of War. Because of the way it was hooked up one side had more leverage and almost always won. It took three family members (all older than 15) to beat just me on the side that had more leverage. So fun! Next up was the Weave A Web! To do this you put your wrist through a piece of rope that is clipped unto one of the many tangled pieces of rope inside that area. Then you have to go from one side to the other, connected to the same rope, never taking your hand out, and trying not to get all tangled! Sound like fun? M really enjoyed this one too! Another area in the Kids In Charge! that she really liked was the Obstacle Course. For one token (you can purchase these for 2 for $1.) she could go through it five times! Here is a short video of her doing the Obstacle Course. Don't forget the MOSI Cafe! All of us except my Dad decided to go for Pizza. Some had Pepperoni and the others had Cheese. My Dad chose a Cheeseburger. It was big! We shared a couple of drinks and had a great lunch. Getting ready to dig in to her Cheese Pizza! MOSI has agreed to send one of my Neighbors a Family Four Pack of General Admission Tickets to Tampa FL. ONLY! Wow! NOTICE : YOU MUST BE ABLE TO VISIT THE MOSI IN TAMPA, FL! It’s cold and allergy season again! And for 119 million US households that are affected that means runny noses, congestion and sinus problems. While many people find relief using over-the-counter and prescription drugs, they might not realize that something as simple as natural steam can have a profound effect on their respiratory symptoms. We’ve all heard the “old wives’ tales”…hold your baby in the bathroom with the hot shower running if they’re congested; use a humidifier to alleviate cold and sinus issues…but it’s actually proven science! The warm mist opens sinuses by thinning secretions as it hydrates and soothes irritated tissues. No drugs are needed, making it an all-natural and safe decongestant. But while even doctors agree that steam inhalation is effective in treating some of the most common respiratory conditions, using steam and steam devices like humidifiers can be impractical (who can really stand in a hot steam shower 4x/day? ), germ-prone, and sometimes pose a burn risk, particularly for children. Now, using FDA approved technology, the NEW MyPurMist™ handheld steam inhaler is reinventing this old remedy in a completely new way -- the world’s first instant, effective, safe and handheld approach to steam and humidification therapy. 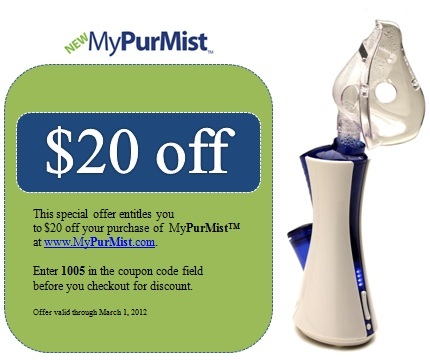 MyPurMist makes using steam practical and easy for those seeking a natural remedy for their cold and allergy symptoms. MyPurMist provides instant relief for cold, allergy, and sinus symptoms via a simple handheld device that requires virtually no preparation, mess, cleanup or maintenance. It delivers instant temperature controlled steam in a germ-free environment, with no risk of scalding like other devices. That means it’s good for kids, too! Better still, 100% of people who have purchased and used MyPurMist will recommend it to others. Source: Hydrotherapy-Simple Treatments for Common Ailments by Clarence Dail, M.D./Charles Thomas, Ph. D.
Steam inhalation is an effective treatment in respiratory conditions and is highly recommended for treatment of the common cold, sinusitis, bronchitis, allergies and asthma. Steam relieves inflammation and congestion of upper respiratory mucous membranes. • Steam relieves throat irritation by moistening the air. • Steam relieves spasmodic breathing (Asthma, Croup). • Steam loosens secretions and stimulates discharge of mucous from the throat and lungs (natural expectorant). • Steam relaxes muscles and relieves coughing. • Steam Keep mucous membranes from excessive drying. There are a multitude of occasions that would call for the giving of gifts. Along with this, there are also a lot of different things that those who want to give gifts can chose from. One of the most popular kinds of gifts that are available to purchase, no matter what the occasion, are gift baskets. These kinds of gifts can be used for birthday celebrations Christmas as well as the traditional gift baskets that are given at Easter. These are usually given to children however depending on your specific occasion it can be for a host of other occasions as well. What you choose to fill your gift baskets with not only depends on the kind of budget that you have but it also depends on the person that you are purchasing the gift for as well. The things that they like and appreciate may surprise you and because of this most people try to select items that are going to be the best match for the person that they are intended for. This is not always the easiest goal to accomplish but it is something that is important especially for the people that you are going to be giving the gifts to. Easter gift baskets in particular are something that is very popular to give during the spring season. Often times it is something that is colorfully decorated and are filled with different things such as candy or other things like small toys or books that are also very popular as well for these kinds of gift baskets as well. Easter gift baskets do not have to be just for the children that are in your life but you can also arrange them for the adults that are in your life as well. You can create these kinds of gifts all on your own by going to a hobby store or to another kind of retailer which allows you to purchase each item separately. There are also those retailers who have put together these gift baskets for their customers so that they can save themselves the time and the frustration of having to go to multiple different locations in order to put together a gift basket for someone whether it is for Easter Christmas or for someone?s birthday. In order to create these kinds of gift baskets all you need are baskets and things to fill them. These can be items that are conducive to the personality of the person or they can be generalized to the things that most people will like such as gift cards or spa products which can be given to a multitude of people regardless of the interests that they may have. These kinds of gifts are always appreciated because they show that you care about the people that they are meant for. It is also a way to showing someone that you put a lot of time and effort into thinking about them as well. Greetings from beautiful, sunny, HOT, Florida! If you have been following our travels, you know that we have been in Ocala, Sarasota, Tampa, Orlando, and we will be spending 4 more days at Wekiwa Springs State Park in Orlando. I have another super neat travel product to share with you. It is called the Embrace Sleep Collar, Travel Pillow. With all 8 of us traveling together, there is almost always someone dozing off on the trip. Now, my children think it is hysterical to watch the one dozing off, as their head bounces and they jerk awake. The Embrace Sleep Collar helps to prevent that. Not only does it stop the head from bobbing around, but it keeps your head and neck in alignment, so you don't wake up with a sore neck, or a headache. If I sleep funny, I almost always wake up with a headache. The Embrace Sleep Collar has Memory Foam, which makes it so comfortable. It has a wicking fabric cover, made from the same material as expensive running shirts, that is machine washable. The Sleep Collar is very lightweight, weighing less than 3 oz. The Sleep Collar is available in 5 different colors. It does not keep you from moving your head, it just supports you. "Among those consulted in the design of the Embrace Sleep Collar include, chiropractors, flight attendants, physical therapists, and even a fashion designer. You can spot each of their influences that we incorporated into the design. The first concept is "passive resistance" vs. "active resistance". The Sleep Collar is not designed to immobilize the wearer. The active resistance of a neck brace or any brace will create stiffness and even soreness in joints and muscles after prolonged use. The passive resistance of the Sleep Collar, allows natural movement, but gives that extra support needed, when trying to relax. The second concept is Posture=Comfort. All day long, your postural muscles in your neck are in contraction, to support your head. When you try to relax, your postural muscles want to relax with you. This is fine when you are lying down, because your bed supports you. However, when you are sitting up, like in an airline chair, your head is left unsupported. The Embrace Sleep Collar is designed to keep your head and neck in proper alignment, allowing you to relax and helping to prevent soreness. Two types of foam (memory foam and high resiliency foam) to provide comfort and support. Internal flex-band to provide even pressure and additional support. Open back design to wear cool. Wiking fabric material (identical to modern running shirts) to wear cool. Mylar carry case with velcro strap to attach to outside of carry-on luggage. Weighs less than 2 oz - less than a baseball cap." My husband is sold on the Embrace Sleep Collar. We both feel that it is quite comfortable. At first I thought it might feel restrictive, but it really does not. It gives you the support you need, without making you uncomfortable. This is perfect for long drives, plane trips, anywhere you might end up sleeping in an upright position. Gone is the nodding off only to jerk awake as your head falls forward. Also, since the collar goes around your neck, you aren't constantly adjusting the location of the pillow. It stays right there. And, if you have tried any of the blow up pillows only to have them spring a leak in the middle of your trip, you won't encounter that problem with the Embrace Sleep Collar. You can purchase an Embrace Sleep Collar on their website for $24.99 with free shipping. You can also enter here to try and win an Embrace Sleep Collar. Disclosure:I received no monetary compensation for this post. I did receive an Embrace Sleep Collar for review purposes. All exact quotes are taken from the Sleep Collar email or website. All thoughts and opinions are entirely mine. Remember the Teton Sports Escape 4300 Backpack? Well, take a look at these pictures! My son was the one who is supposed to use it, but my 11 year old wanted to try it on! With a sleeping bag in the bottom and supplies and clothing on top, you can really pack this backpack. There are also some smaller pockets for little items. We were camping at Wekiwa Springs State Park Near Orlando Florida. The Escape4300 is a large pack designed for week-long trips or times when you have lots of gear. Aluminum stays and high-density foam back panel keep support right where you need it. Includes padded waist and shoulder straps, multiple load adjustments, and torso lengthener that can be fit to your body without removing pack. This hydration-ready pack fits a 2.5-liter bladder (not included), has a 4,300 cubic inch capacity with seven pockets, two pouches, four compression straps, daisy chain gear loops, D-ring, eyelets, and slide-storage under hood. Top and bottom access to main compartment for convenience. Built in rainfly included with each pack. She wanted to wear it so bad! This pack comes with the special rain fly that covers the whole outside of the pack. Here it is without the rain cover. Here you can see all the straps that you can tighten or loosen as needed. Now here is another entry for the Teton Sports Escape 4300 Lightweight Backpack. We will have at least one more before it ends. Leave a blog post comment on the original post using Rafflecopter, telling me where we were for these pictures. Here is the link to the original post: Teton Sports Escape 4300. And remember by clicking on the link below you can purchase this product through Amazon. Do you ever have mold and mildew show up in your bathroom? We do! We own an older home, and for some reason the mold seems to grow here faster than I have ever seen before. We really have to watch the caulked areas around the tub and shower. I think since the house has obviously "settled some", the tub is on a slight slant, so water seems to pool in some areas on the sides, encouraging mold growth. I am constantly looking for new or different ways to stop mold growing here. I have used vinegar to try and keep it under control, but it just never seems to keep it under control. One time I used bleach with a spray bottle and I would apply it, let it sit for several minutes and then use a toothbrush to scrub it out. It took several times of repeating this process. And of course you need to have a well ventilated room to do this. Unfortunately our bathroom has no windows, a perfect setup for mildew growth, so I have to set up a fan to blow fumes out the door and out the bedroom windows when we clean. We usually soak the shower curtain in a tub filled with water and bleach and allow it to soak. Then we rinse thoroughly and re-hang to dry. We have to do this about twice a month to keep the mildew under control. The boy's bathroom is set up the same way, with no windows, so we have the same problems there. At least they only have a shower to wipe down! We are actually considering re-doing all the caulking to see if this will help. Any neighbor who has a suggestion please feel free to leave a comment. If we weren't on a road trip, I would include pictures! Now, Tilex has a new product out Tilex Mold Stain and Mildew Stain, Refreshing Breeze, that I think I might give a try. And not only do they have new products, but to introduce them they are having a "Cancel the Mold Show in Your Bathroom" Sweepstakes. Are you interested in entering? They are giving away 3 large 40" flat screen TVs as well as some other prizes. Just visit the Tilex Facebook page for more information, but I will let you in on a secret, you will receive an extra entry for each friend you invite. Take a minute to view the video with Sonny Mold and Frankie Mildew, two trouble-making stars. And then try Tilex to remove them from your own bathroom! So, be sure to "like" Tilex on Facebook and enter the "Cancel the Mold Show in Your Bathroom" Sweepstakes! “I wrote this blog post while participating in the SocialMoms and Tilex blogging program, for 8,000 My SocialMoms Rewards Points. For more information on how you can participate, click here. I just received some information about a really neat, new site! It is called Recipes for Fun, and is done by Clorox Clean-Ups. The whole thought being that sometimes having fun can be messy and Clorox Clean-Ups can help, well...with the cleanup part! On their new site, Recipes for Fun, you will find crafts, cooking, wacky science, all sorts of fun projects you can do together with your children. The best part is that for the opening of this new site, Clorox Clean-Ups is having an Ultimate Mess Party contest. You, my neighbors, can sign up for a chance to win $10,000 towards an Ultimate Mess Party! Plus there are other prizes being awarded daily, just for registering or sharing a recipe. Now I know some of my neighbors have some great ideas to share! So hurry over to Recipes for Fun and enter. Having had 6 children, we have run through all sorts of crafts and recipes. Even the boys participated in crafts and cooking. My youngest is presently going through a cooking stage! She loves to try new things! She recently baked her very own loaf of bread and made a chocolate cream pie! I thought I would share the recipe she used! Add dry ingredients to a large mixing bowl. Mix them together. Then add 1 cup very warm water and the 2 Tablespoons softened margarine. Mix on low speed or by hand for approx. 1 minute. Slowly add more flour, perhaps a 1/4 cup at a time until dough is moist, but not sticky. Place the dough in a well oiled bowl and turn it so that it is all lightly coated with oil. Cover the bowl with plastic wrap and allow to rise in a warm place until it doubles in bulk. (We sat ours on top of the stove.) This takes approx. 45 minutes. Grease your loaf pan. Punch down your dough. (Another part my daughter enjoyed.) Place in pan, seam side down. Very lightly oil the top surface. Cover loosely with a clean cloth and allow the dough to rise again. You want it to be about double the original size. Anywhere from 25-40 minutes. While you are waiting for the dough to rise, pre-heat your oven to 450 degrees. After about 10 minutes reduce the temperature to 350 degrees. Bake about 30 more minutes. The crust should be a golden brown when done. Remove pan from oven, remove bread from pan and allow to cool on a rack. My family was never very good at this. They always want to eat it right away. Yes, we had a mess to clean up, be sure to remember Clorox Clean-Ups, but she sure had fun! And the smile on her face when she was done was worth it all! I just have to add another fun recipe we use, which is really easy. We make our own donuts! Moms need to over see this because you cook them in hot oil, but the children love cutting them out and then coating them with sprinkles, sugar, or even melted chocolate. We start with refrigerated biscuit dough. You lay the biscuits out on a dry surface and using a small circular object, we have used plastic soda bottle lids, cut out the center of the biscuit. Save these, because your children will enjoy eating donut holes too! Fill a pan with oil and bring to a slow bubble. Slowly drop your donuts in and watch them cook. It doesn't take long. You will need to flip them over so both sides cook. Take them out and lay them on a rack for a moment to cool. Then allow your children to roll them in sugar, or sprinkles, apply icing or chocolate, and enjoy. Ours disappear as fast as we make them. Now be sure to visit the Recipe for Fun site and enter their Ultimate Mess Party Contest. Also be sure to like the Clorox Facebook page. “I wrote this blog post while participating in the SocialMoms and Clorox Clean-Up Recipes for Fun blogging program, for 8,000 My SocialMoms Rewards Points. For more information on this program, click here and see the Terms link.